From Cleveland:I-71S to Columbus. 270E to US 33E. US 33E thru Lancaster to SR 664S. Go 4 miles and turn right onto Big Pine Road. Go 5 miles and turn left into Happy Trails. From Columbus:US 33E thru Lancaster to SR 664S. Go 4 miles and turn right onto Big Pine Road. Go 5 miles and turn left into Happy Trails. From South Cincinnati: SR 32E, the Appalachian Highway, to Piketon. Turn left onto US 23N for about 25 miles to SR 159N of Chillicothe. Drive three miles on SR 159N turn right onto SR 180E. Go 12 miles to Laurelville. From Laurelville take SR 56E. Go 4 miles and turn left onto Big Pine Road. Go 8 miles, past SR 374, and turn right into Happy Trails. From North Cincinnati: I-71N to SR 35E to SR 159N of Chillicothe. Drive three miles on SR 159N turn right onto SR 180E. Go 12 miles to Laurelville. From Laurelville take SR 56E. Go 4 miles and turn left onto Big Pine Road. Go 8 miles, past SR 374, and turn right into Happy Trails. From Dayton:SR 35E to SR 159N of Chillicothe. Drive three miles on SR 159N turn right onto SR 180E. Go 12 miles to Laurelville. From Laurelville take SR 56E. Go 4 miles and turn left onto Big Pine Road. 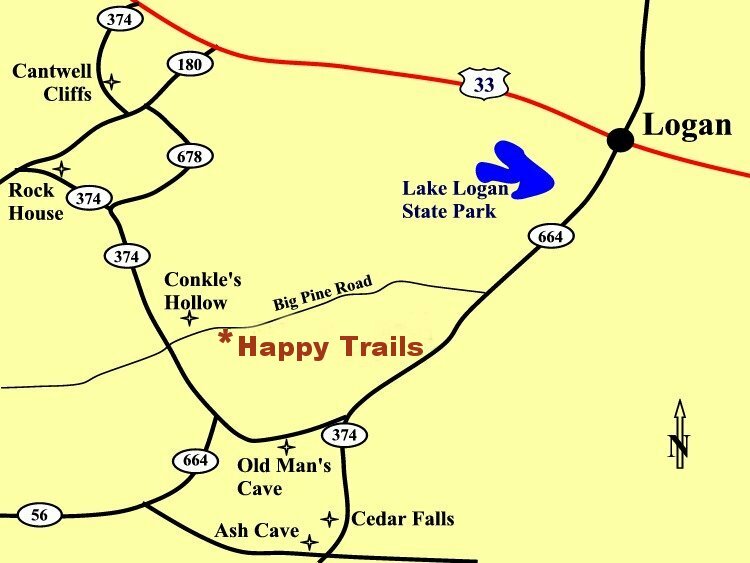 Go 8 miles, past SR 374, and turn right into Happy Trails.